Martin Place hosted an assortment of far-right groups on Sunday morning at the Reclaim Australia rally in the CBD. Around 250 people draped in Australian flags and brandishing placards with xenophobic slogans began to gather in the area bordered by Macquarie and Phillip streets near the Martin Place train station from around 8am. Not far away, a larger group of almost twice as many counter-protesters, including Indigenous activists, students and left-wing groups, assembled further down towards Castlereagh Street, though the two camps were kept roughly 250 metres apart by a strong police presence that formed a dividing barrier blocking movement between. Above: Reclaim Australia protesters in Martin Place. Picture Credit: Tom Joyner. SRC president Kyol Blakeney was among those at the counter-rally, and spoke well of turnout. “It’s always pleasing to see so many people come to stand up against the scum that is the United Patriot’s Front and Reclaim Australia,” he said. Speakers at the counter-rally spoke of the irony in the organising group’s desire to “reclaim stolen land”. They also blamed the federal government’s ‘fear-mongering’ for fanning Islamophobia and distracting from wider cuts to social spending. While police had originally feared the outbreak of violence at this weekend’s rallies staged around the capital cities as well as smaller regional centres, both rallies in Sydney’s Martin Place remained largely peaceful compared to their Melbourne counterpart, with speakers from both sides urging against violent activity and the rival groups kept mainly apart. A number of speakers addressed the rally organised by the Reclaim Australia group, including Sherman Burgess (known to his followers as the Great Aussie Patriot), whose Facebook page declares he “[speaks] out against radical Islamism and left wing Australiaphobes,” and who had spoken at the Melbourne rally a day previously. Burgess commanded what could only be described as a mythic reverence in the gathered crowd, with many clamouring for a selfie at the end of his speech. 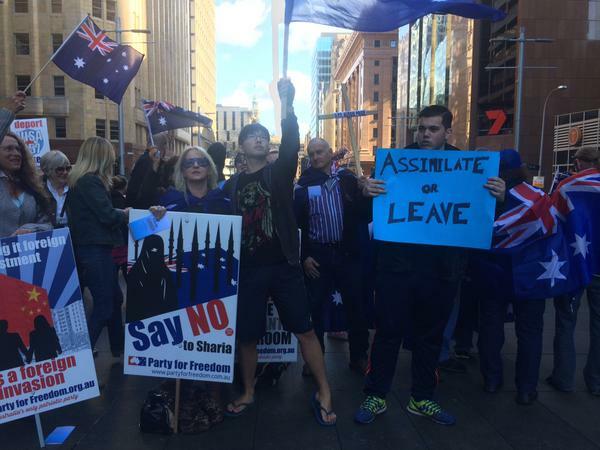 Common themes among Reclaim Australia speakers included patriotism, the Anzacs, ‘political correctness’, militarism, Islamophobia, anti-multiculturalism, with frequent reference to ‘Australian values’. One speaker also railed against Chinese property investment and the recent approval of the Shenhua Watermark mine in the Liverpool Plains to rapturous applause. Speeches throughout the rally were punctuated by music segments that drew cheers and singing along from some in the crowd, including to songs like Peter Allen’s 1980 hit ‘I Still Call Australia Home’ and Lee Kernaghan’s ‘Spirit of the Anzacs’. 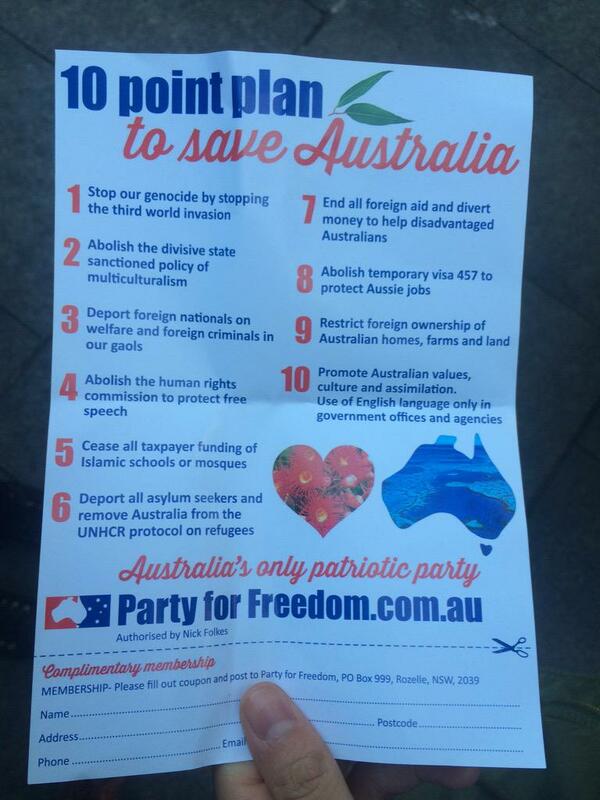 Flyers distributed included one from Party for Freedom detailing a ’10 point plan to save Australia’. At the counter-rally, a small number of Reclaim Australia supporters seen trying to move through the crowd were quickly mobbed and shouted down by chants of “Nazi scum off our streets” before being pulled away by police. Media reports have since noted five arrests at Sunday’s rally, although this Honi reporter did not witness that himself. Pictured: Party for Freedom’s ’10 point plan’, circulated during today’s rally. Photo credit: Tom Joyner.